The Nevada Department of Transportation (NDOT) will close I-15 southbound between Sahara Ave. and Spring Mountain Rd. 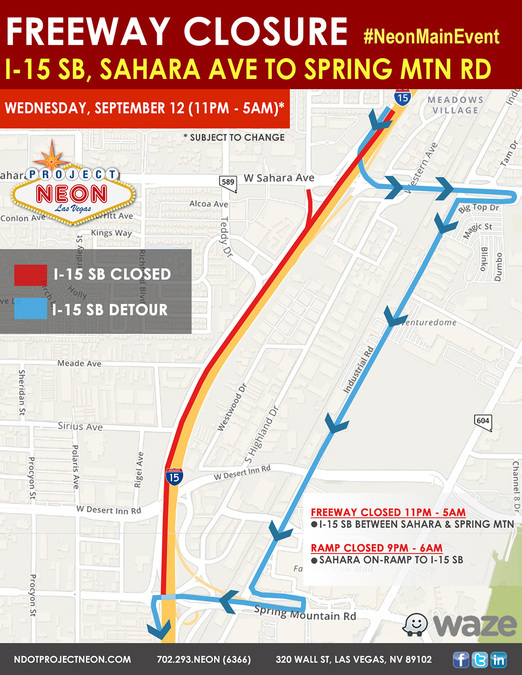 from 11 p.m., September 12, until 5 a.m., September 13, The Sahara onramp to I-15 southbound will be closed from 9 p.m., September 12, until 6 a.m., September 13. The temporary closures are needed to install overhead traffic management signs as part of “The Main Event,” the final phase of work for Project Neon’s nearly $1 billion 4-mile-long widening of Interstate 15 from the U.S. 95 interchange to Sahara Ave. Project Neon is 81% finished and scheduled for substantial completion in the summer of 2019. Drivers should use caution while traveling through the work zone, heed construction signage, and take alternate detour routes, if possible. Check the Project Neon website (NDOTProjectNeon.com) or Facebook, LinkedIn, and Twitter pages (@NDOTProjectNeon) for up to date information. There is also a free smartphone app available, plus a hotline available in both English and Spanish at: 702-293-NEON (6366). NDOT works with Waze to inform the public about planned highway restrictions, but unscheduled construction changes, closures and restrictions are possible due to weather or other factors. For the latest state highway conditions, visit nvroads.com or call 511 before driving.